Everyone can save the world, but sometimes you have to start small. Take a look at the Middle School Student Service Leadership Team (SSLT) for instance. “So, what does SSLT do in the first place?” you might ask. Well, we do many things such as make onigiri for the homeless people in Ueno Park, collect rice for Second Harvest Japan, participate in projects to assist students in the Tohoku region, organize loads of fundraisers, and volunteer at ASIJ events. One of the activities that we participate in each year is sponsoring the Middle School Back to School dance. For that dance this past September, we had an Airhead candy fundraiser. We had bought boxes and boxes of Airheads in the states and sold them at our dance. Almost the entire school bought Airheads and we raised over ¥40,000. All the money went to support our efforts in Cambodia. In Cambodia, all water is not clean. So we built two wells this year in the countryside, in the center of two separate villages, so that families there can have clean water to drink. We also used this money to finance the education of a middle school student in Phnom Penh. Spirit Day brought students, and their friends and family out to a great day of fun and activities! On September 28, students from the SSLT came out and worked thirty-minute shifts to sell spirit bracelets and Maasai jewelry. We are pleased that the SSLT made about ¥30,000 to support our projects. In October, ASIJ held the Middle School Halloween Dance. The SSLT sold special Halloween glow bracelets for the students to wear at the dance, and it turned out to be a great success, because we were able to raise over ¥20,000. We donated this money to an organization for Filipino typhoon relief. We also collected money for UNICEF and were able to make a donation of ¥50,000. SSLT students participated in Winterfest by selling assorted items at our booth and by helping the PTA with their beverage sales. 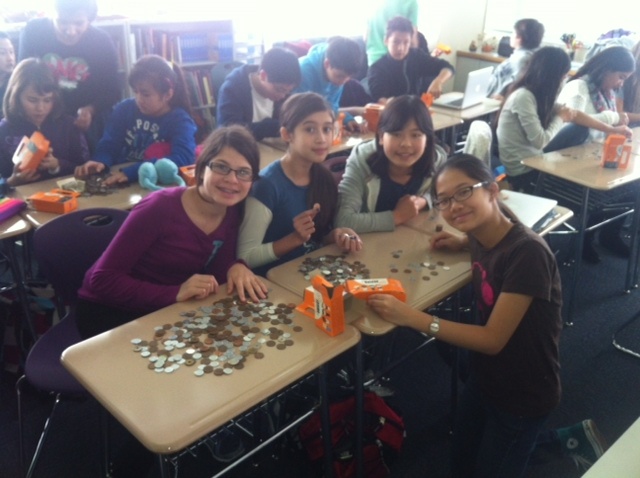 We also sponsored “Coins for Candy” with all proceeds going to Second Harvest Japan. At this event, we raised approximately ¥30,000. We are off to a good start this year and have many more projects planned for the second semester.